Preheat oven to 350°. Toast walnuts on a rimmed baking sheet, tossing once, until golden brown, 8–10 minutes. Let cool, then coarsely chop. Cook fregola in a large pot of boiling salted water according to package directions. Drain (do not rinse) and spread out on a baking sheet to let cool. Prepare a grill for medium-high heat. 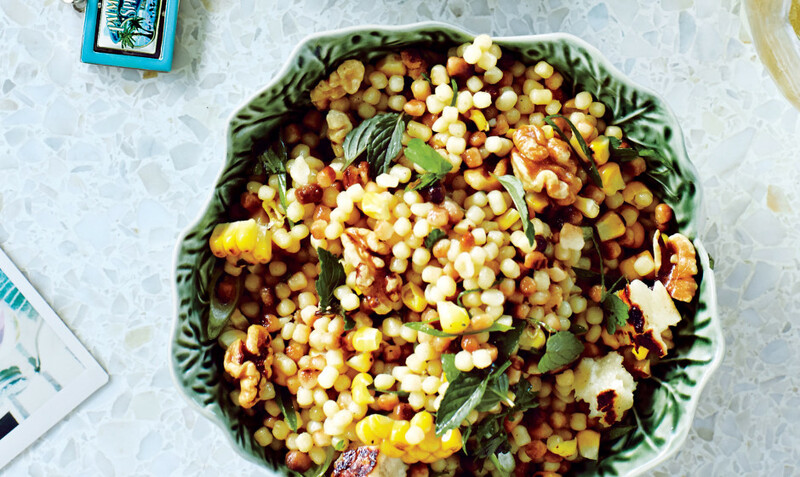 Rub corn with 1 Tbsp. oil; season with salt and pepper. Grill, turning occasionally, until lightly charred and tender, 8–10 minutes. Transfer to a platter and let cool. Meanwhile, brush cheese with 1 Tbsp. oil and grill, turning once, until lightly charred in spots, about 5 minutes. Transfer to platter with corn; let cool. Cut kernels from cobs and place in a large bowl. Add scallions, parsley, basil, mint, walnuts, and fregola. Using your hands, tear Halloumi into bite-size pieces; add to bowl and toss to combine. Add lemon juice, vinegar, and remaining ¼ cup oil. Toss to coat; season with salt, pepper, and more vinegar, if desired.